Fibre board- is a lightweight, insulating board use for the floating installation of laminate, It is ideal for use on cold floors and is used to flatten uneven floors with imperfections up to 2mm. Wood and laminate flooring needs to be laid on top of a completely flat sub-floor this is why fibre board is the perfect solution. It is also environmentally friendly and biodegradable. Sliver- This underlay has an integral aluminium foil vapour barrier with a 200mm joint overlap. When used with vapour tape its acts as a waterproof membrane. It is suitable for correcting minor floor imperfections. It is 100% recyclable and has very good acoustic qualities. 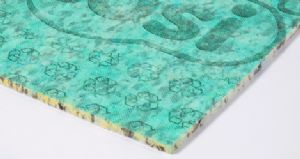 This type of underlay should be used on concrete sub- floors, it can be used with wooden but there is no need for the extra cost for having the waterproof membrain. Therefore it better to go for the budget underlay as it has the same qualities minus the membrain. Solid Wood flooring does not require any underlay.